Our second day here started at 6:30 am but we didn't have to wait as long getting through passport control this time. We were very lucky with the weather as we had 2 beautiful sunny days (St. Petersburg typically has 13 or 14 sunny days in a year!). 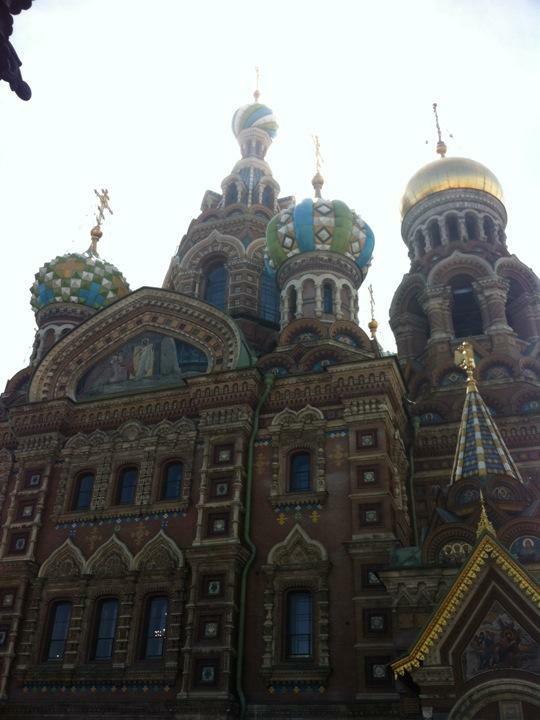 Started with a city drive followed by a boat ride on the canals and Neva river. Lucky we went early as the number of boats battling for space later on was incredible! Our next stop was the Hermitage museum which has over 3 million art works (not all of them are on display). We saw paintings by Da Vinci, Renoir, Rembrandt, Monet and Goya; large green urns made of Russian malachite which were stunning, and lots of tapestries, mosaics and marble busts. Very crowded in the museum, got sick of pushing by the crowds so we were glad to get out. Lunch was inside one of the palaces (there are over 1000 palaces in St Petersburg) - more caviar and vodka! The afternoon was spent at the Church of the Saviour on Spilled Blood (built on the site of the assassination of Tsar Alexander II) and shopping for souvenirs, where we were served more vodka!